Everybody safe so far? I certainly hope you are! 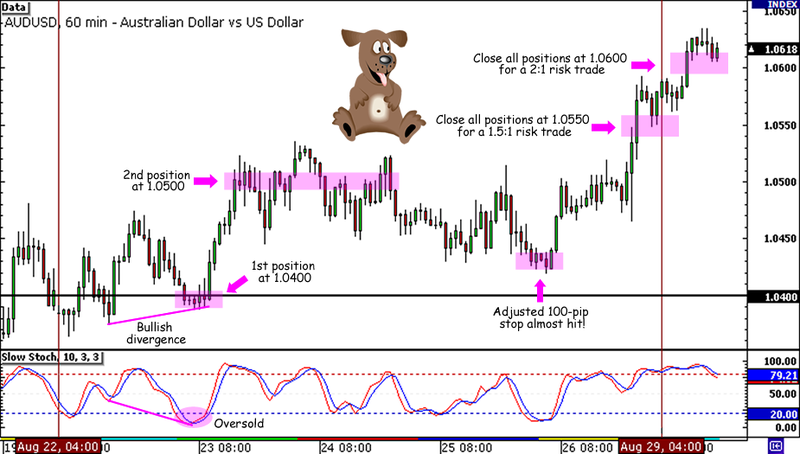 And if you’re anything like my friends who like to be updated on comdoll price action no matter what, then here’s a 150-pip setup I found on AUD/USD! Last week while markets’ attention was on gold’s fresh record highs and its sharp retracement before the Jackson Hole meeting, I was concentrating on my NZD/USD trade. Too bad it didn’t work for me like my USD/CAD trade! As it turned out, AUD/USD popped up a pretty good swing trade setup. If we take a look at the pair’s 1-hour chart we can see that it registered a clear bullish divergence on an early Tuesday. It hung around the 1.0400 major psychological handle for a while before it shot up to above the 1.0500 level during the day. For the rest of the week the pair ranged tightly between 1.0500 and 1.0450. If we had entered at 1.0400 and placed a 100/1/1 stop-trail-add strategy, our stop loss would’ve moved to 1.0400. That means we would’ve caught the big jump to 1.0550 last Friday, which would’ve yielded a 1.5:1 reward-to-risk trade if we had closed all our positions at the level. But not only that – if we had held on to the trade until early Monday when the pair went all the way up to 1.0600, we would’ve gotten a 2:1 risk trade! Of course, hindsight is always 20-20. Let’s just hope we can spot these kinds of setups early and actually jump on it this week! Meanwhile, on to the good news – I have a new BFF! Just like many of you out there, most of Keith’s trades are somewhere in between day trades and swing trades. It’s probably because he also has those days when he has more time with the charts than the others. When asked what’s the one thing he can’t trade without, elgitano5720 reveals that he can’t trade without music to keep his nerves calm. And why not? Apparently, this BFF of mine is also an audio/mastering engineer! He says that his dream is to become a full time trader and just leave his music as a hobby and not as a job. I sense a new Big Pippin in the house! So what’s Keith’s advice to fellow newbie traders? STICK TO YOUR TRADING PLAN. He says that you must stay disciplined and avoid having temptation get the best of you. That means less 9gag and Facebook and more trading! Another trading nugget that he shared is the importance of having trade journals. He says that it has helped him become a better trader, and that hopefully it will help you too. Shoot, I’d like to share more, but it’s almost time for my morning yoga! I’ll be back in a bit though, so just leave a holler at any of the links below and I’ll try to get back to you as soon as I can! The comdoll gang was off to a lazy start for the week as AUD/USD, NZD/USD, and USD/CAD all consolidated during the first few days. Part of this could be blamed on the lack of hard-hitting economic data from their respective economies. 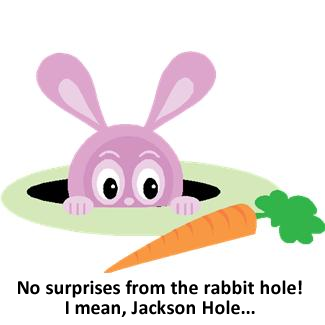 Another reason for their sideways action was probably the uncertainties ahead of the Jackson Hole Symposium. You see, as Forex Gump pointed out in his Jackson Hole article this week, the U.S. dollar took a huge hit after last year’s symposium. That was when Fed head Bernanke hinted that the U.S. needed another round of stimulus, causing traders to lose appetite for Greenbacks. Now that the U.S. economy still doesn’t seem to be doing so well, traders hesitated to take any dollar positions, fearing another big announcement from Bernanke. However, Bernanke failed to make any mention of QE3 in his speeches. Instead, he simply postponed his announcement later this year, still causing the dollar to selloff. Of course, the higher-yielding comdolls took advantage of dollar weakness as AUD/USD, NZD/USD and USD/CAD pushed for gains on Friday. I guess I should’ve taken the markets ranging behavior into account when it came to managing that NZD/USD long trade I took this week. I was able to catch a pretty good entry but I was a bit too aggressive and conservative at the same time. Had I anticipated further sideways movement, I probably shouldn’t have added to my position right away and I probably shouldn’t have trailed my stop too tight. Lesson learned!